The month of September is waning, and the best chance for songbird migration is ramping up. During this continuing lull (it has still been HOT), it seemed like a good opportunity to scamper to Miami and try to get a few species that are endemic or established there that we generally can’t find elsewhere. I met up with Camille and we set out before sunrise to get to our targets. We were hoping for two species, both that have become sort of “nemesis birds” for both of us: the Mangrove Cuckoo and White-crowned Pigeon. Our first destination was Black Point Park and Marina [map], where some Mangrove Cuckoos had been seen recently. This species is notoriously secretive, and though this time of year isn’t necessarily the best time, having a recent sighting in an accessible hotspot made it irresistible to attempt. It was a clear and beautiful morning at the marina. Unfortunately for our information regarding the birds’ location was a bit sketchy, and being unfamiliar with the area, we wandered a bit before finding the right spot. That meant the morning had worn on quite a bit. While we did see other birds, we never got so much as a hint of Mangrove Cuckoos. Not a cuckoo, but it’s always nice to see Loggerhead Shrikes. In our wanderings around the marina, we took a paved path, closed to vehicles, that paralleled a canal. 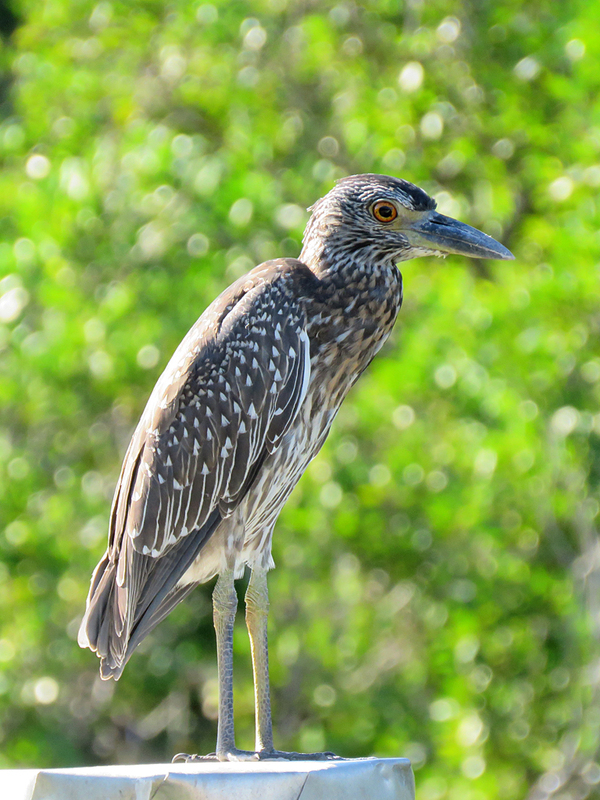 There were several heron and egret species, including several young Yellow-crowned Night Herons, like the one below. Like their cousins, the Black-crowned Night Herons, this species’ young are brown and streaked, which helps keep them camoflagued in the grasses and other vegetation near their nests. These birds were fledged, and will soon molt into their gray and black adult plumage. Yellow-crowned Night Herons are less stocky than the Black-crowned, with a yellowish or orange eye, instead of red. 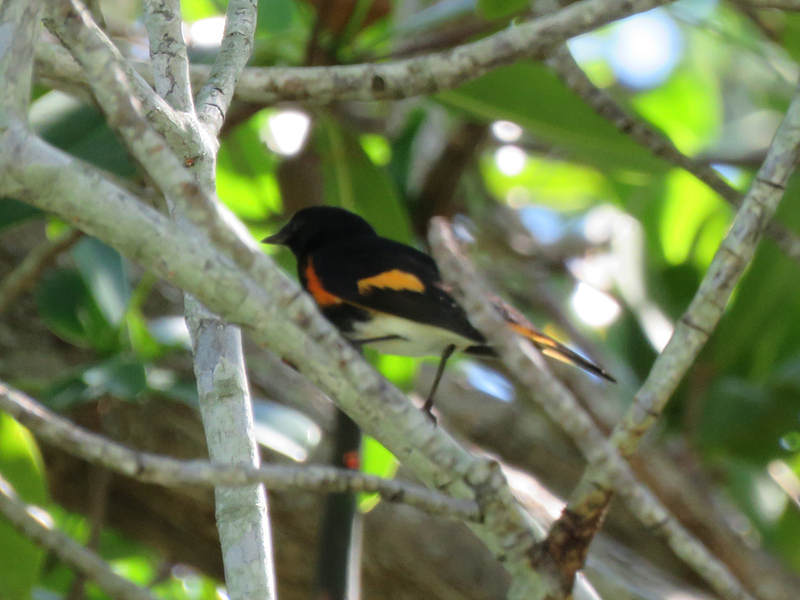 Our first migrant of the day was a lone American Redstart in some trees near a small bridge, by a flood control structure. The same area had a huge amount of Black Vultures both on the ground and swirling above in a large kettle, probably due in part to the row of nearby dumpsters. American Redstarts should become more numerous across the region in the coming weeks. By the time we found the (likely) actual spot the cuckoos had been seen, the morning had well worn on, and it was getting hot. We hung around for a few minutes but to no avail. We broke for lunch before making our way to the Baptist Hospital of Miami [map] and cruised around its grounds for any parrots – there were none – before heading into the Kendall area neighborhoods to find White-crowned Pigeons. Predictably, bird activity was low in the heat of the day, but we did get a few pockets of birds as we worked westward through and past some parks and ball fields. We finally ended up at Indian Hammocks Park [map]. As we drove through the entrance and into the park, a female Scarlet Tanager flew into a tree on the right side of the car, and some small birds could be seen and heard in the tree tops. Camille pulled us over and we got out and scanned the vicinity, taking note of some Blue-grey Gnatcatchers and Red-bellied Woodpeckers. After a few more minutes, Camille drove to park the car while I stayed to investigate (this turned out to be somewhat unfortunate, as I left my camera in the car). I tracked down a Yellow-throated Warbler and some more gnatcatchers before checking out the family of Red-bellied Woodpeckers, further from the entry road. Some movement high in a tree, under some dense canopy caught my eye: a White-crowned Pigeon! Happily, it stuck around (and another joined it in the same tree) until Camille made it back from the parking lot. This species has given us both fits over the past few years. It’s not uncommon, and any eBird search for it results in hotspots and personal spots peppered all across the Miami area with sightings, but until then the bird had eluded us. After some high-fives, a couple of lifer dances, and a quick look at a Baltimore Oriole, we made our way further west to see if we could find the Zenaida Dove (and some shorebirds) reported over the previous week in some agricultural fields (known as the “West Kendall Agricultural Area” [map]). Zenaida Doves are Caribbean endemics; they are rare vagrants to south Florida (though their similarity to Mourning Doves might cause some to have been missed in suburban settings). The bird hadn’t been reported for a couple of days, but it was worth our while to check it out. The only shorebirds in attendance were a great many Killdeer and several Least Sandpipers probing some muddy puddles for whatever morsels they could find. Some birds are quite flexible in finding food. 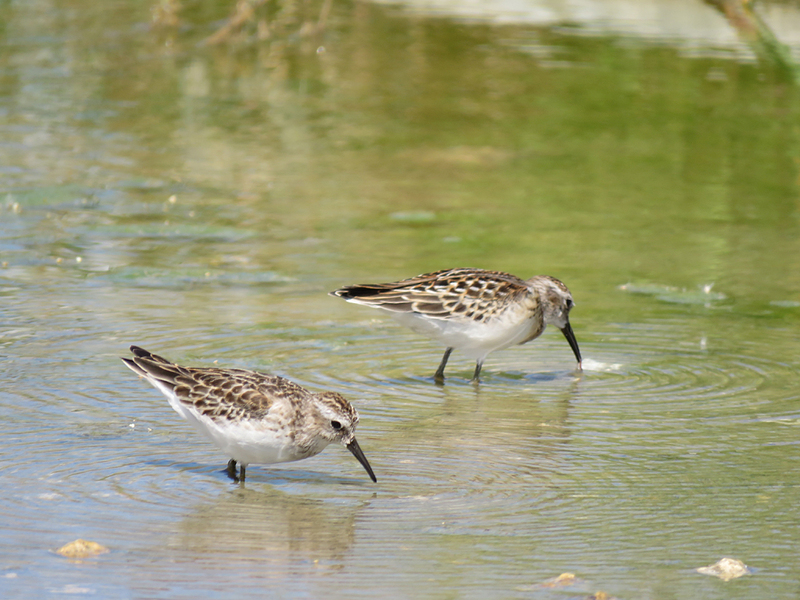 These Least Sandpipers were feeding in a dirty puddle in very disturbed sand and dirt near a small airport, adjacent to some agricultural land. There were a few Mourning Doves present, but as we walked over to the farthest “puddle” in the immediate area, a slightly redder dove, with white in its wings, was flushed up and quickly flew to the west – a Zenaida Dove! I was able to follow it a ways in my binoculars, getting a very good look. Unfortunately, Camille’s attention had been elsewhere and she never got a good look. We scanned for a while longer, and even after a Killdeer-filled ride further into the agricultural land and back, the dove was never relocated. From there, it was off to the last stop of the day: the “Tamarac Exotic Duck Pond” in Palm Beach County [map]. For some reason, most of the ducks, geese, and swans found on this urban pond are countable on eBird, though not for ABA lists. 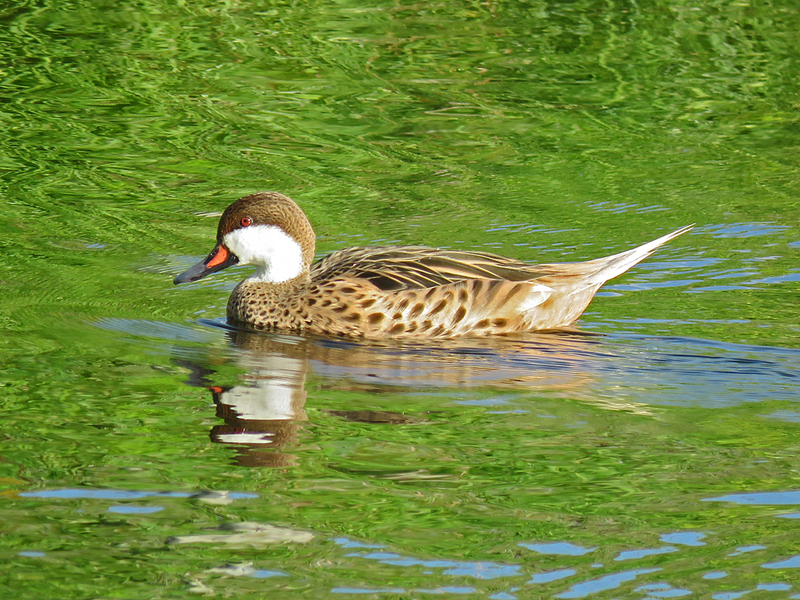 It fairly obvious these birds were introduced, but they are still beautiful and were a treat for the end of the day. Here are a few of the birds we saw. 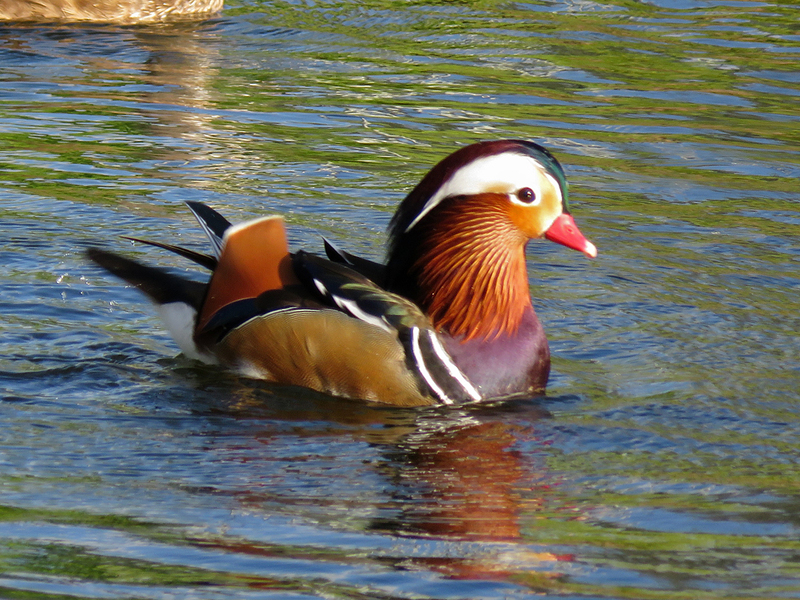 There was one male Mandarin Duck that seemed to be paired up with a female Wood Duck (who was largely ignoring the male Wood Duck). 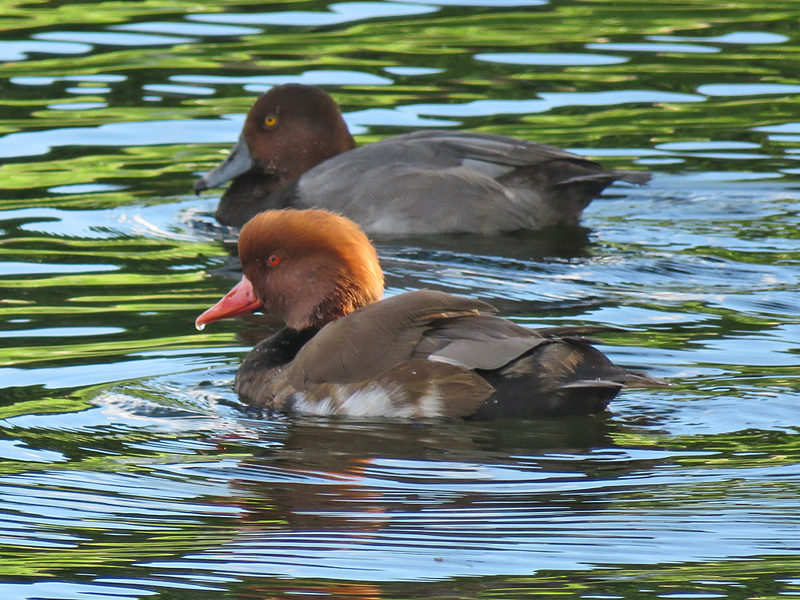 A Red-crested Pochard (foreground) with a more mundane Redhead (background) it was seemingly paired up with. 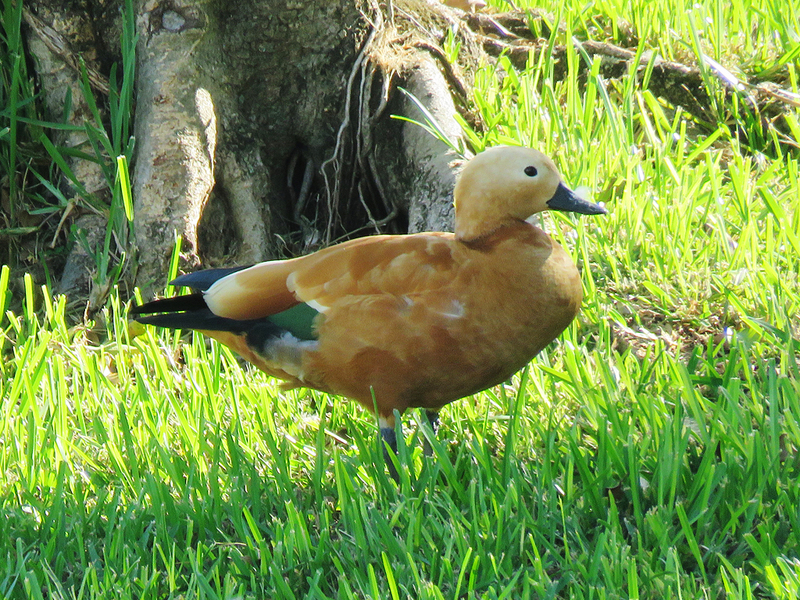 A Ruddy Shelduck on the bank of an urban water retention pond. It was hanging out with some Egyptian Geese. With the sun starting to sink low, we decided to end the day and head home. Getting several lifers (including the ducks) made for an exciting day. Hopefully this coming weekend will see some local areas “heat up” with migrants as the days cool down (again, hopefully)!